Blogging | I think therefore I write! I hadn’t thought about visiting Diu 5-6 yrs back and all I knew, it’s a union territory. When I heard about this from NID friends from NID and also got to know it ‘s a peaceful beach place unlike Goa, so I planned I will visit it someday. Recently when I visited Ahmedabad I thought to take bus from there to Diu but got to know there are no volvo bus service so search for train started. Diu doesn’t have a railway station though it has a airport and flights from Mumbai to Diu goes there. So we took the Somnath express to Veraval. Timing of this train was good and we reached very early morning and made a quick visit to Somnath, which is also known as “the Shrine Eternal”, because it has been destroyed 6 times and rebuilt 6 times. We took a cab to Diu. Veraval to Diu is approximately 90km and take around 2hours 30min. We stayed in a small resort Hoka because there were very few beach resorts and resort Sugati and Radhika were already full. Hoka was a nice resort with good food service and it was very near to famous Nagoa beach. Earlier plan was to hire a bike and explore the city but seeing the heat in city we kept the same cab as anyway we had to leave next day. We started with Sea Shell museum, which has varieties of shell from all over the world. For sure, it has great collection but very untidily and unorganized! Next was Gangeshwar temple, which was built by Pandavs and sea water keep it clean and cool. Our next stop was INS Khukhri which was built in memory sailors who chose to go down the sea with the warship when it was hit by a Pakistani Submarine during the INDO-PAK war. One of the natural prehistoric tourist point was Naida caves, it’s located outside the city and it was worth a visit and gave you a roaming inside a maze feel. Upcoming movie- Agneepath climax (Sanjay dutt dying) also shot here apart that, Karan Johar entire movie set was made in Mandava, Diu. Nest in List were- Diu museum and St paul church followed by Diu fort. 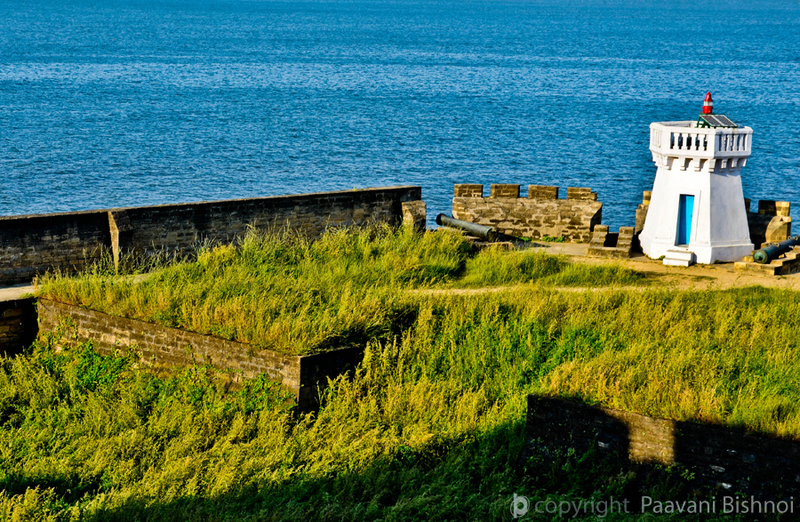 At Diu fort you can see lots of cannons and also a light house and at distance you can see Panikotha. With that we almost ticked marked all places and moved to Nagoa beach for some hot corn and tea break. Next morning was also spent in relaxation at beach. Later in day we went to Sugati resort for lunch. Hotel was nicely done but quite disappointed with red cushioned plastic chair and b&w check table cloths and sad interior at there one and only restaurant. We had an evening train to catch from Veraval so we headed back and reached Ahmedabad at dusk and from there next was to catch the flight to Delhi. New year is the time of year to party and celebrate. Thanks to Facebook we all got power to be page 3 celebrities! After all, Social media is the new generation lounge. So don’t be surprised when you hear about Facebook’s record breaking fact– 750 million photos got uploaded on New Year’s weekend by users. Every status update, every photo album we upload is to show to the world, how awesome our weekend is going, how much hard work we do in the office and where we go for vacation. Facebook now speaks about the life that used to be told earlier with personal touch. I wonder what we are going to talk when we really meet in person! Other than of course talking about people who are not updating status message or one who don’t have any new photo album from past one week! How many times we login on facebook just to see the new activity! If life was actually so interesting, why would you update about it the time you are actually enjoying it. Social media has real disadvantages; just other day I read how people started irritating others by sending fake ‘blood needed’ message. Funny how a live person dies, because of an unconfirmed tweet. Social media really made a common man a self-certified media guy! He can publish his own page-3 content, and break out breaking news that can create panic in one tweet! For sure sometimes social media helps. But was life not moving when we were not aware how much traffic is on which road or where what incidents happen? We were updated then also but now we are overloaded with information and when this overload becomes a burden, it directly hampers our lifestyles. With an attention span of less than 5 minutes, who are we fooling when we can’t sit to do single task peacefully! Has someone tweeted back, or has a new like/comment been made on the last photo or is an unread mail in the inbox popping up every second! You global personal reporter and trendsetter, better take life lightly. Is it a matter of pride or a case of plagiarism – this was exact thought that came to my mind when on 18th august morning I saw my ‘Independent India’ image in MTV’s latest National Anthem video on Television. 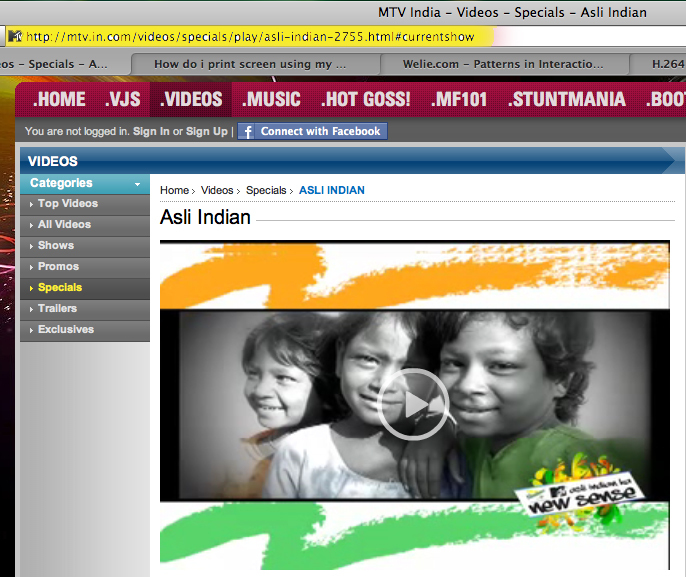 After photo plagiarism case MTV India deleted previous videos, edited & uploaded new video http://www.mtvindia.com/newsense You can easily see the difference- so many images including mine was stolen by MTV. 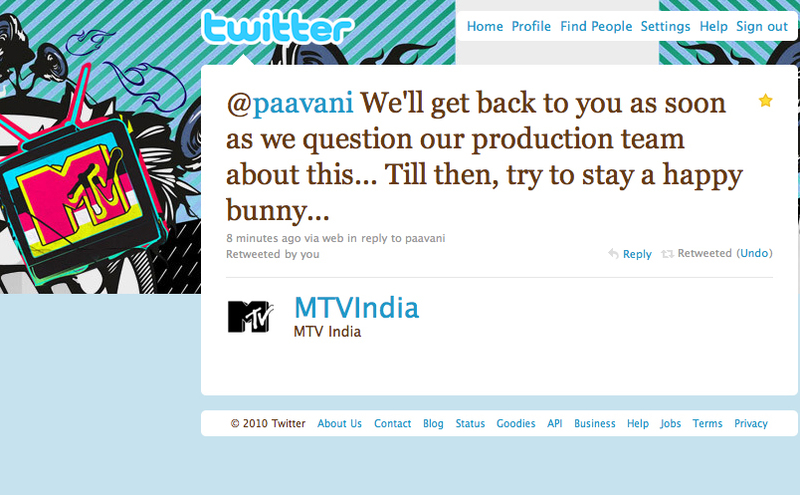 I tweeted to MTV India and @MTVindia replied saying they are asking their production team & till then I stay a happy bunny! STRANGE, I never got a response back after that. 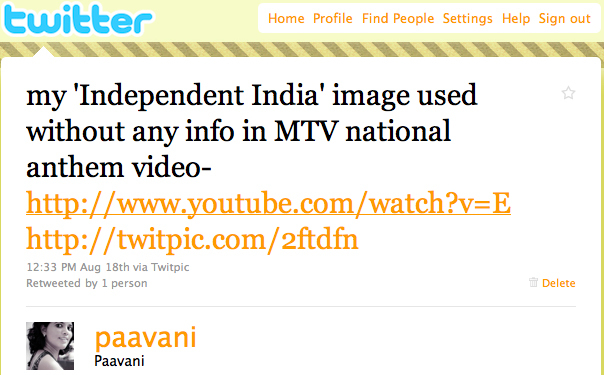 Instead, they deleted the tweet response, videos from MTV India website and their your tube links etc within in an hour. And 3 days later, I now see a new video, which does not have many images (including mine, which means other photos were also picked up without permission) – and the same video is on the Television and the Internet. I kept writing to MTV on twitter and also I wrote an email to Viacom 18 COO, Rajesh Kamat (Viacom 18 channels are Colors, MTV etc). But I didn’t get any reply. People at Twitter / Facebook started suggesting me to send a legal letter to MTV for the same or talk to someone from media but when I tried contacting media like IBN (which is part of network 18), I didn’t get a reply. The only option in front of me seems to be taking a legal route. In a country like ours, it is however a lengthy method to ask for credit and compensation by going to the court. However, I am tempted to do that not because of the wants for credit but also to spread awareness amongst other people of the illegal and unethical doings of these large companies. This photo steal case is 2nd for me, but there have been umpteen other cases like this which have happened with my photographer friends. Through this blog, if there is one thing I want to do – it is to spread awareness amongst such media companies and their employees who routinely pick up pictures and content from internet without realizing that not only is it unethical but against the law as well. Perhaps it is their supervisor / seniors who don’t tell them about these basic work ethics! When MTV India, a youth music channel, picked up my image and few more images to use in the national anthem ‘jana gana mana’ video, they probably searched for ‘india independence day’ or something similar and selected few good images and used in videos for which they spent few thousand dollars. This was all done and televised on TV without realizing that they had done a grave mistake of using images for which they did not have the copyrights. Another bad ethical practice by MTV was them initially replying to me on twitter without understanding the consequences, where they later deleted video from website and Youtube and also deleted the tweet. They did not do the basic thing that they should have had done at the earliest was to handle this case of plagiarism in a mature way by immediately apologizing. Given what it was used for, I would have given my image for free but what eventually happened gave me a sad impression about MTV and seniors. For saving few thousand rupees, MTV will carry a stamp of ‘pursuer of plagiarism’. They could have easily handled this more gracefully, but they ended up spoiling it and become the bad icon of the year! I am hurt not because my ‘ Independent India ’ got stolen by MTV but for the shameful act of they trying to remove the traces of their wrong doings from the Internet. Poor MTV, you just become ‘plagiarizing icon of year, 2010! When I heard about twitter almost 2 years back, I was not sure will I use it. But yes, I created an account as it seemed different, not like an SMS sending service. I become active in tweeting from end of 2008. In this tweeting journey, I made many tweeple friends and I met few either in some conference or in meet. Journey so far was going quite tweetful. I was following around 150 people- from designers, photographers, bloggers to social media enthusiasts. Almost 760 followers I had till 28th july 09 which included some very great & genuine persons from celebrities to ad world guru to photographer, researcher and many more. But, one bug which Twitter had eaten by mistake and made my account go crazy. I lost all my followers (except few spammers) and no timeline updates for me. Yes, my timeline is frozen and I can not see any updates. Even if I follow back people my following count stay zero! I can only see, if someone specially write a @paavani tweet. It is frustrating that twitter has not fixed the problem though many people are facing the same. There is no customer support. See this twitter support page on following list vanished and timeline frozen. Now when twitter is getting popular and everyone started tweeting, facing such a problem and loosing data is big nonsense. Twitter will loose the trust, if it keep surprising their tweeple with such mis-hap. One side twitter is coming up with business strategies and other side when they launch a new home page this is what bugs come up! If you don’t know what TWITTER is-: it’s like writing SMS- 140 characters is a tweet limit. One can follow certain people and check their updates in own timeline. One can send and receive message on mobile phone too. Read some good stories about twitter. Anyway, I am damn annoyed with Twitter. It is acting like a cheap, buggy web application site. Its not just about moving stuff from one place to another but safely & organized way so that when you are standing in new home with cartons lying here & there could arrange back easily. beds, furniture, appliances, crockery and gamla (flower pots) etc. : Don’t carry anything that you don’t need. start disposing or sale the stuff you don’t need like cloths, newspaper. : Stop buying the bulk grocery items. Postal department, insurance papers, bank & credit cards. As well as give the payments to newspaper man, cable wala, milkman etc. : Mark it to remember. When packing the stuff in cartons, put a label to simplify what’s inside. Do this even if packers & movers are helping. : Visit it and arrange it. Go to new place, have an idea so that can make a visual map to arrange back the things. : Be there, and love it. While the things are in transitions and unpacking, be present. Gradually start arranging the things and start liking the new place though attachments with old place is natural. And many more things you will learn after the move. There is so much talk about Social Networking as hottest thing in 2007, even a network (Orkut) chosen as MTV youth icon 2007. It’s like making YOUR presence, staying in touch with people either for personal or professional growth. And there was Time magazine (early 2007) cover page saying ‘Person of the Year is YOU’. Recently I read an old article ‘Brand you by Tom Peters. Whatever you are doing (or going to do) is reflecting in your personality. Either the way you dress up or the way you hold the fork. Your very individualistic style to signature to the favorites programmes on T.V. Everything is composing you. It’s not a simple system. One might feel it’s a single entity, but it’s a whole complex system that is composing the YOU. Compile- Strengths, Weakness, Power, External factors, Risks, Time (very important). Just to make you stay focused on goals, how to achieve that. Compete- Learn & Improve, Keep yourself updated. What you learnt was past. Think future, work in present scenario. And for that updating skills and being informative is a need. Stay Tuned– Meet others, Talk, Discuss, Argu, Laugh & Enjoy. Express yourself. It not only gives attention but makes you happy too. And getting noticed among in crowd is important if you really thinking of Branding yourself. So either blog or upload a video on youtube but do something to shine. Balance- Work, Family & Networking. Don’t be you only, be the complete person. Know how to equilibrate everything. Getting the right rhythm to balance everything is making the real you. Pamper yourself either with music, books or join health club. Keeping fit will make you more fresh and full of energy. And come out with new innovative visionary ideas. After all you are the brand. Be Brand new in every stage of life. There are so many How would you rise and shine in same and similar people. 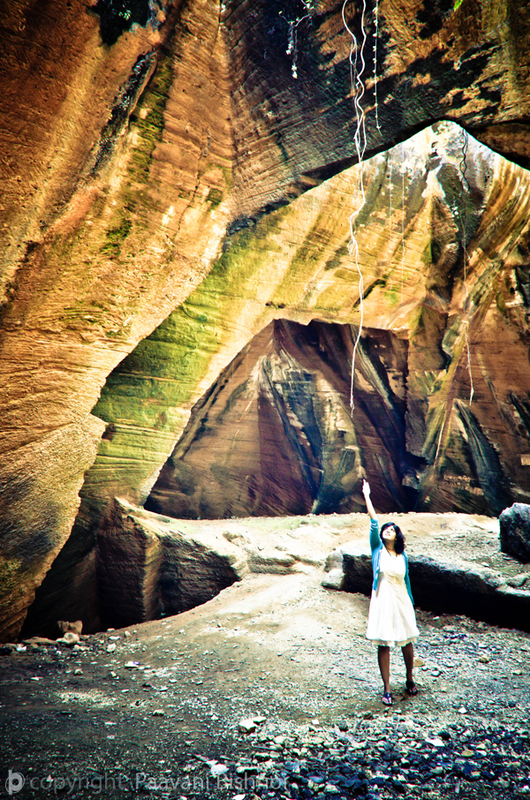 It has been long time since I blogged about anything. What was it means: nothing new happening or was I so busy that didn’t get time. No, nothing like that. It was just that when there was over information flow, one get lost what to talk. Silence is golden at times. BTW I was quite active in my Flickr (earlier I was not), I even wrote a guest blog article for Ping Mag (one of the best design blog, from Japan). In my work place, I am learning many new things. And try to understand much more.Any way, what’s happening in World? Especially in Design sector, that too in India? Always make more sense to Indian Designers.The Digital design experience or people in User interface design would be happy to know about Nokiaâs first satellite design studio in India, Bangalore...will explore a range of design trends and themes, including detailed research into colour and material trends in India. It will also study use of mobiles for Internet in India and its implications for design, and examine innovative new features and uses for mobiles. I expect, soon I will get a handset for elderly. Last month only I was looking for a mobile for 60+ in not so urbanized area, which has basic functions and easy to navigate interface. Sorry to say I didn’t get a single mobile handset which fit the bill. I would like to say– few models are so sleek & smooth that it can look good only on an executive hands. While a field worker continuous sweating hand will make it uncomfortable to hold. So many features- do we really need it? Few don’t even want to send & receive SMS. Price range versus features. If it is a 2K mobile, is it really helpful in getting what one want? Don’t compromise quality by adding too much. So many models, with little difference, so much of confusion. From Samsung to Nokia to new Bleu. A sliding cell phone with similar looks. Total money expenditure- a 3G phone with cool features. But your current service provider gives you all that good service to operate those? If yes, how costly is it? Or you have to change your years old mobile number. Even if you browse internet on your blackberry and check emails after every 10 min. Is it comfortable or just leave you more frustrated? Your mobile is more of FM/ Camera to click pictures secretly or more to mobile blog? Once you are comfortable with your current handset. It got stolen/broke, and you switched to new model of same company. Do you feel ease to operate it? If no, why so much complexity to understand all navigational system of a handset. Why mobile buttons are so small? Why no models catering to those who donât have such sleek fingers to press the right tab? Regional language settings are there- but how many really needy use it? There are many more concerned areas; these are many more simple questions other than styling & color of cell phone. I am really disappointed when I visited Nokia exclusive showroom and did not get a cellphone which display text/numbers in good contrast on a reasonably good screen size along with basic features that work in a small town. Like FM. I hope, new Nokia design studio work in more user friendly way and come up with designs that really cater to the person who need it for basic functions not a gizmo. As number of mobile users in India are more than other parts. And these maximum numbers of users donât work in corporate offices of a metro. Lots of events are going to happen infact happening. First there was Pune Design Festival, celebrated on 17-18th November, 2006. This time theme was ‘Winning by Design’. And then there is most awaited event of the Year : The CII-NID Design Summit. This conference brings together the people who have interest in design and working in this field and industries connected or want to associate with them. The main agenda of this is helping India to emerge as a Designer land in global marketscape. So listen to the best of speakers, meet interesting designers. More about speakers can be read here. Venue: Hotel Taj Palace, New Delhi, India. Apart from this National Institute of Design, Ahmedabad is celebrating the 27th convocation on 7th Dec., 06. And for all creative people out here, a good international fair is on. It is India International Trade Fair or IITF or better known as Trade fair in India. It is ongoing in Pragati Maidan in Capital of India, New Delhi from 14- 27th November, 2006. So check out handicrafts products, Chinese stuff and more. Caution avoid going on weekends. If I go there expect some pictures of the event from me. Venue : India Habitat Centre (IHC), New Delhi, India. Agenda: Planning a seminar style meet, Discussions/preparations for the upcoming Blogcamp. B is the letter that I love not because my surname starts with it. It has some beautiful memories. No more talks on What to B(e). Have you heard about a bird, bird that flies in paradise? Well there it is a flower, names Bird-of-paradise. This is my next entry for Flower Fest. I made a sketch of the flower as I was not able to click picture (That I will also do soon). If one will fall for the bright colors of it, you can not stop appreciating the form of this flower too. The name Bird of Paradise comes from the spectacular flower shape, which resembles a bird’s beak and head plumage. More details about this flower is; banana shaped leaves and that’s why it was classified in the banana family Musaceae, but now got own family Strelitziacea. You will be amazed if you see how its blooms. Long stemmed flowers emerge from green boat-shaped bracts, which are bordered in red or purple. The numerous pointed petals of brilliant orange are contrasted with an arrow-shaped tongue of vivid blue. Some species have white and blue. The flowers have several “sets” of flowers in each bract, which are formed on the end of a stalk. I was just wondering how many creative ideas you get from nature, nature that is full of awesome products. And in such an exotic forms and wild colors you found the inspiration. Ideas that immerse from the paradise are truly divine.